Sweet, isn’t it? 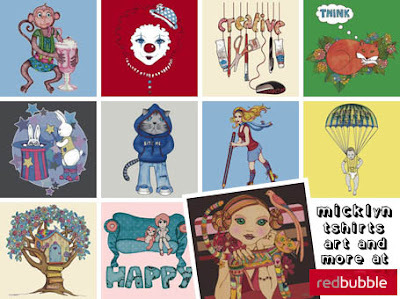 Micklyn is an incredibly creative designer who creates cute and whimsical works across a number of different mediums. So the next time you’re looking for a cute kitten print, or a beautiful illustration, or just want to get yourself some sweet clothing, you’ll know where to go, wont you? And, as I hinted at in my introduction, there’s even a t-shirt with a clown on it! Perfect!